Happy Valentine's Day Blog Fam! Update: Thanks to the other bloggers that didn't leave a name I want you to feel the love too. sweet! I always like how you incorporate it all. Happy Valentine's Day, blog mama! Perrrrfect! I think you do stay up all night! Oh my goodness - that is the cutest..... Nice work. What a sweet Valentine's pic. I love it! You are truly amazing. Happy Valentine's Day! Love it! Thanks for including me! 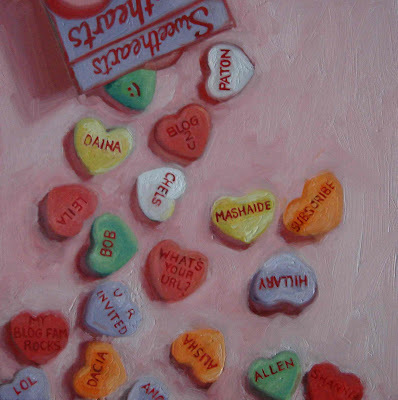 Thanks for including my name in your latest painting and for dropping by my blog. I hope you and your family had lots of candy, chocolate and love. Take care and I'll see you in the blogosphere.